"Hotel Restaurant" La Baita " Livigno, traditional mountain property, surrounded by flowers in summer and snow in winter. Strategic location, in the heart of the pedestrian area of the town. A beautiful winter holiday for your staying in this small hotel, close to the ski lifts and the magnificent cross-country track. The hotel also has an excellent restaurant. In addition to the extensive menu of local cuisine, you will find all the best Italian dishes, accompanied by an extensive wine list. Guests of "La Baita" are entitled to a free pass for access to the car park opposite to the hotel. Enjoy the free bus service that circulates through the streets of the town (close stop next to the structure). Wi-Fi, ski room with heated boot room, terrace / solarium, free use of bicycles. The owner, Mr. Cominelli, and his staff, welcoming and kind, will be able to guarantee you a wonderful stay. 2- What “Personal Data” does labaitalivigno.it collect? 3- Why does labaitalivigno.it store Personal Data? 4- How does labaitalivigno.it process “Personal Data”? 5- labaitalivigno.it. do you share “Personal Data”? 8- What use does labaitalivigno.it. cookies and tracking technologies? 12- Can children use labaitalivigno.it services? The user can contact us for questions regarding the privacy policies of labaitalivigno.it. not covered in this Privacy Notice. 2. What Personal Data does labaitalivigno.it collect? Sending or requesting information: when the user provides information through the Services, labaitalivigno.it collects Personal data such as the name, surname, email address, telephone number. The necessary amount of Personal Data on a participant may vary depending on the services requested. 3. Why labaitalivigno.it. store personal data? labaitalivigno.it. Personal data in real time to fulfill legal or regulatory obligations and for their business purposes. labaitalivigno.it. Personal data by number of votes required by law, if it is in its own legitimate interest and if it is not prohibited by law. If the User’s account is closed, labaitalivigno.it. Personal data and other information, but reserves the right to store data and access it for as long as necessary. labaitalivigno.it. edited and disclosed such data in accordance with this privacy statement. 4. How does labaitalivigno.it. do you process personal data? labaitalivigno.it. Personal data of the User for a series of data justified under the data protection legislation in the European Economic Area (EEA) and in Switzerland. communicate with the user about Accounts, Sites, Services or labaitalivigno.it. To comply with the obligations of labaitalivigno.it. the terms of the labaitalivigno.it websites and services, as well as to comply with all applicable laws and regulations. market products to the User, provide marketing materials on labaitalivigno.it online products and services. and on products and services of independent companies. labaitalivigno.it. it could also work based on measurement, so that they even more coincide with those that labaitalivigno.it. he believes are the interests of the User. providing the User with options, offers or information for a given location, the user accepts geolocation information through the Services. labaitalivigno.it. Data is available based on location, such as advertising, search search, and other customized content. To respond to requests, for example, to contact you about a question sent to the labaitalivigno.it customer support team. The user can revoke the consent free of charge at any time. For more information on how to proceed, contact us by email at info@labaitalivigno.it. 5. labaitalivigno.it. do you share Personal Data? labaitalivigno.it. non-conductive with personal data or other user information. The labaitalivigno.it operations. they are supported by a network of computers, cloud servers and other infrastructure and data technologies, including others from third-party providers. The parties indicate above may be located in jurisdictions other than those of the User and outside the European Economic Area and Switzerland. These countries are not always a level of equivalent privacy protection. labaitalivigno.it. has taken specific measures to protect personal data. In particular, for transfers of “Personal Data” within companies linked to labaitalivigno.it., labaitalivigno.it. it relies on the “binding corporate regulations” approved by the supervisory authorities. . If you are dealing with third parties outside the European Economic Area or Switzerland, this is labaitalivigno.it Service. a platform, such as social media, outside the European economic area of ​​Switzerland, labaitalivigno.it. Personal data of the User to these third parties in order to provide the User with the requested Service. 8. What use does labaitalivigno.it. cookies and tracking technologies? Do not Track (DNT) is an optional browser setting that allows the User to set their own preferences for tracking advertisers and other third parties. labaitalivigno.it. DNT not of iron to the signals. Personal Data Options collected by labaitalivigno.it. Personal data. The user can refuse to provide the data requested by labaitalivigno.it. Information and other information at the device level. The services are available on the User, which has information on the User’s headquarters, which labaitalivigno.it. can then collect and use. For information on the possibility of restricting the collection and use of this information, the settings available on the device can be used. Options related to personal data by labaitalivigno.it. Online tracking and personalized advertising. labaitalivigno.it. collaboration with partners and third party service providers for proposal to the User advertising through advertising cookies and web beacons. The user can choose not to receive advertising cookies and web beacons of third parties, in which case the advertising of labaitalivigno.it. it should not be aimed at the user. The user can view labaitalivigno.it advertising. on third-party sites. If you do not have an account or if you have questions about data or other Personal Data, you can contact info@labaitalivigno.it. Information and more: the User registered by labaitalivigno.it. All users who use the important information and other communications requested by the User himself at labaitalivigno.it. The user can not request not to receive such communications. However, it can change the medium and the format with which they receive these communications. Subject to the limitations established by the laws of the European Economic Area, the User has certain rights in relation to his Personal Data. In particular, the User has the right to access, rectify, limit, oppose, delete and transfer data. To exercise these rights, the User can contact info@labaitalivigno.it. If the User wishes to send a request for access to all personal data that labaitalivigno.it. has on him, will have to keep in mind that ID is required. If you have an Account for any of the labaitalivigno.it Services, you can generally review and modify your Account Personal Data by accessing and updating information directly. 11. How does labaitalivigno.it. protect the User’s Personal Data? labaitalivigno.it. adopts technical, physical and administrative security measures designed to ensure adequate protection of the User’s Personal Data from loss, misuse, unauthorized access, disclosure and alteration. These security measures include firewalls, data encryption, controls on physical access to data centers and access rights to information. Although labaitalivigno.it. does all it can to protect its systems and Services, the User is responsible for ensuring and maintaining the confidentiality of their password and account registration / profile data and to verify that the Personal Data that labaitalivigno.it. owns on the User itself are correct and current. labaitalivigno.it. is not responsible for the protection of personal data shared with third parties following a connection to the account authorized by the User. 12. Can children use labaitalivigno.it services? The Sites and Services are not intended for minors. We do not knowingly collect data, including Personal Data, about children or other individuals who are not legally eligible to use our Sites and Services. If we learn that we have collected the personal data of a minor, we will immediately delete them, unless we are obliged by law to keep such data. The User is requested to contact us if he / she believes that labaitalivigno.it. erroneously or unintentionally collected information about a minor. If the version includes include a substantial change, labaitalivigno.it. a one day of 30 days, on labaitalivigno.it. In addition, labaitalivigno.it. can inform users of the change via email or other tool. For questions about data info@labaitalivigno.it. If the user is not satisfied with the way in which labaitalivigno.it. for his concerns, he has a right to complain to the data protection authorities of his country. Account: a user account labaitalivigno.it. labaitalivigno.it. 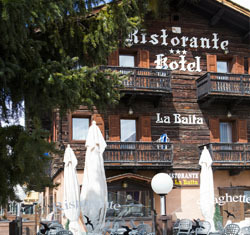 : means Hotel La Baita Via Bondi 98/102 – 23030 Livigno (SO) And affiliated or affiliated companies. In this Privacy Notice, labaitalivigno.it. it is sometimes referred to as “us”, “to us” or “ours”, depending on the context. Procedure: any method or procedure adopted by labaitalivigno.it. to manage personal data or personal data sets, with or without the aid of automated processes, such as the collection, registration, organization, structuring, storage, processing or modification, extraction and consultation, disclosure by transmission, dissemination or any other form of making available, comparison or interconnection, restriction, deletion or destruction of “Personal Data”. Services: any product, service, content, feature, technology or function and all related sites, applications and services offered by labaitalivigno.it. with an Account or a Transaction as an Unregistered User. Sites: websites, mobile apps, official social media platforms or other online properties through which labaitalivigno.it. offers the Services and on which labaitalivigno.it. has published this Privacy Statement or its link to it. User: a natural person who uses the Services or accesses the Sites and who has established a relationship with labaitalivigno.it. or that uses the Services as a buyer, including Transactions as an unregistered user. Would you like to receive more information or to book directly your holiday? Contact us to be the first to receive our best offers. In our restaurant you can rediscover the real flavors of Valtellina. Come for lunch and stop for dinner in our restaurant the taste is home. Take advantage of promotions reserved for our clients. Hotel La Baita Livigno is synonymous with quality and savings. Check, live, the Weather and Webcam of Livigno, to be in pole position!